Doesn't this look like the dog's breakfast? I think it looks better in person, and hopefully the recipient will, too. 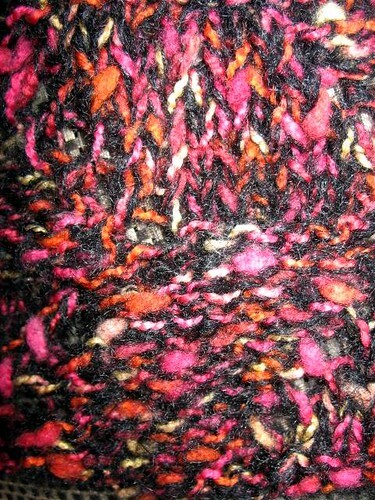 Crummy light today, but I am hoping to wrap this and get it in the mail soon, since it has to go to Vermont for Xmas. 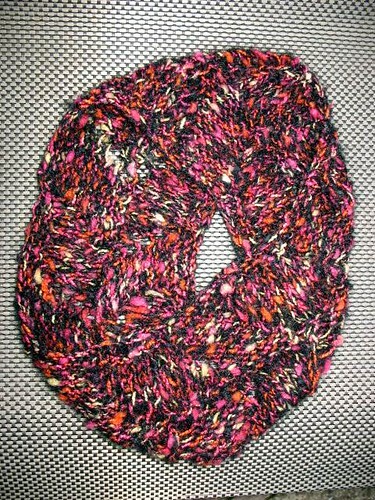 It is a Moebius scarf (couldn't you tell?!) for my uncle's girlfriend. That is such an inadequate term when he's in his 80's and she's been with him over 20 years, but -- well, I'm open to suggestions. I've been making socks so much lately that I was astonished at how quickly this knit up. That's what bulky yarn will do for you. Pattern: basic stitch pattern adapted from Cat Bordhi's Cashmere Cowl: *Yo, k6, k2tog, yo, p6, p2tog. Repeat from * to end of round. Next round, K the K's and P the P's. Lather, rinse, repeat. Cat's pattern would have you knit only, no purls. This comes out with stockinette on one side of the center spine and reverse stockinette on the other. Mine alternates the stitch patterns for more variety. I think it came out OK. I ended with 2 garter stitch rows and a standard bind-off. This was an extremely fast knit, which helped me knock one more item from my Xmas knitting to-do list. Next up: socks for my half-brother. Looks good, though, and I'm sure it will be appreciated. Girlfriend is a fine word in that situation, even if it seems a little more high school than 20-years-together. It's a whole new blogging, knitting world out there. 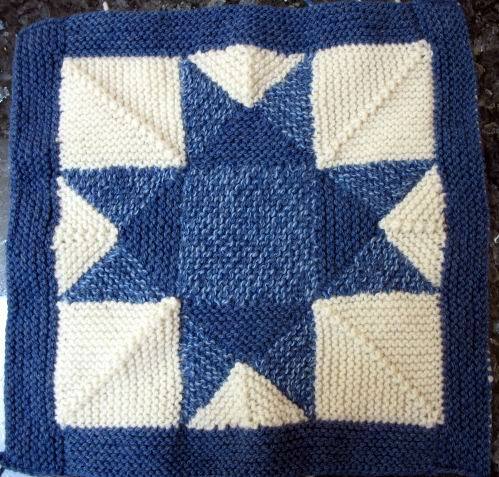 Log Cabin Baby Blanket -- done at last! !